Turkish police sealed off streets, searched cars and blew up suspicious packages Friday as part of a huge security sweep a day before President Bush arrives in Turkey and a day after bombings killed four people in two cities here. Around the convention center where a NATO summit begins Monday, police installed dark-blue steel barricades. Officers searched the trunks of cars and frisked people along the road to Istanbul's airport, causing gridlock on Istanbul's already clogged streets. Helicopters flew near the summit area and over an Ottoman palace where a dinner for NATO leaders will be held. The security measures came after two explosions Thursday -- one outside the Ankara hotel where Bush is expected to stay and a second on an Istanbul bus. The bombings killed four people and wounded 17. On Friday, Istanbul Gov. Muammer Guler identified the bomber in the Istanbul attack as a 29-year-old woman who was a member of a left-wing militant group and was wanted in two previous attacks. The woman died, apparently when the bomb accidentally detonated on her lap. Guler did not say which group the woman belong to. Authorities said earlier that leftists appeared to be behind Thursday's bombings. Militant Kurdish, Islamic and leftist groups are active in the country, and security in Istanbul has been of special concern since last November, when four suicide truck bombings blamed on the al Qaeda terror network killed more than 60 people. Scores of people believed to be linked to radical groups have been detained in security sweeps in recent weeks. On Friday, Istanbul police detained some 40 people with suspected links to illegal groups, including about 15 who were believed to have been trained in Afghanistan and possibly have links to al Qaeda, security sources said. Several foreigners were among them, the Anatolia news agency said. It was not clear whether authorities would press charges. Also, Istanbul prosecutors formally pressed terrorism-related charges against 64 suspects linked to DHKP-C who were arrested in operations in Italy, Belgium, Germany, the Netherlands and Turkey in April, Anatolia said. The crackdown came ahead of the NATO summit and the Olympics in Athens. More than 23,000 police will be on duty during the NATO summit, which Bush, British Prime Minister Tony Blair and France's Jacques Chirac -- among others -- are to attend. In Istanbul and Ankara, police blew up several suspicious packages Friday. Ilhan Saracoglu, who shines shoes near the summit site, said he was afraid not only of bombs but also of loosing business due to the security. "There might be more attacks," Saracoglu said. But "if I don't work for a day, I'll be hungry." 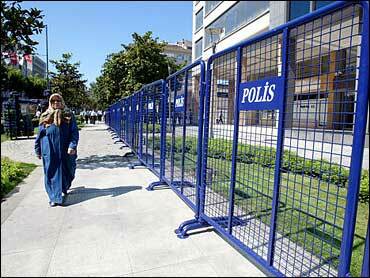 Turkish police sought to ease security concerns. "No one should feel panic or fear," national police spokesman Ramazan Er said Friday. "Our country has hosted many international meetings in previous years ... and our own security forces took the security measures for them." A Slovenian tourist, Luka Stepancic, said he was happy with the security measures. "It took an hour to go somewhere that should have taken five minutes," said Stepancic. "I'm not nervous.... There are thousands of police around. I hope they do their job." Daily protests have been held against the summit and the Bush visit. The president is extremely unpopular in Turkey, where most people opposed the Iraq war. Some 500 worshippers gathered Friday after prayers in Istanbul's 16th-century Beyazit mosque, some chanting "Death to Bush." Police detained two demonstrators who hung a banner from a suspension bridge spanning the Bosporus that read "Let's break up NATO, the murderer of peoples," Anatolia said.